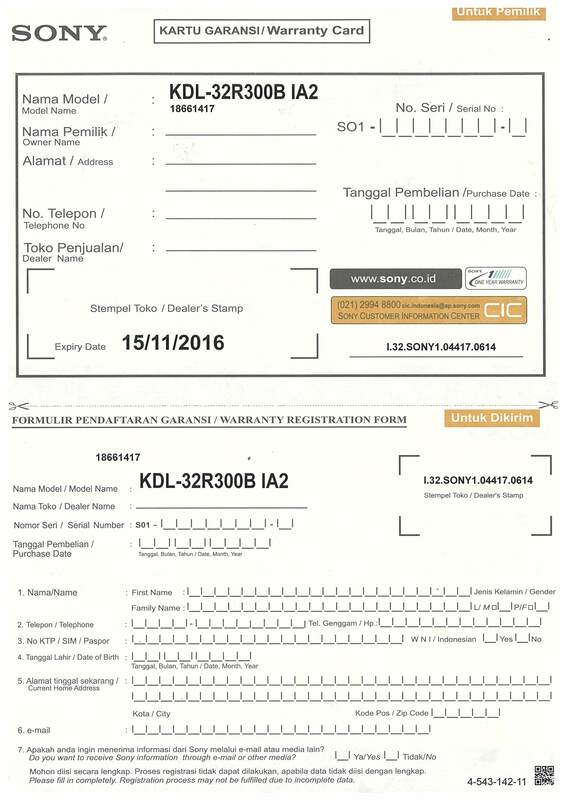 Since May 2005, PT Sony Indonesia has changed the old warranty card with the new "Warranty Registration Form". This "Warranty Registration Form" will be given by Sony's dealer or Sony's shop where you purchase the new Sony product. For your satisfaction, please register your new Sony product by filling up the warranty card and send it to us within 7 days after the purchase date. By registering your product, you will receive the confirmation letter and secure your product warranty. All Sony product owners with PT. Sony Indonesia warranty is entitled for 1 year coverage (spare part and service ) "free of charge" should there be an occurrence of any problem in your product. This warranty card shall only be valid in the territory of the republic of Indonesia and commence from the data of the Purchase. You can also enjoy the benefits of our after sales service at Sony Authorized Service Center all over Indonesia. When you plan to purchase a Sony product, please choose the right one. Make sure it is a PT. Sony Indonesia warranted product. We look forward to serve you! Please retain the purchase receipt with chop and the original unit packaging as proof of purchase from all Sony Authorized stores & dealers. Warranty will be 1 year and counted from the date of purchase. If the customer cannot show its purchase receipt and packaging, warranty will be rejected. Warranty is only valid for purchase in Indonesia (no international warranty for MDR). Sony Indonesia will not issue any warranty card and you do not need to register the warranty online as there is no serial number on Sony MDR products. Every ‘defective’ product will be replaced, and there will be no refund; unless in special circumstances. Other situations will be handled case by case basis. When customer finds that his/her unit is defective, he/she can bring his/her units to the nearest Sony Authorized Service Center. If the ‘defective’ product has been discontinued and is no longer stocked anymore in the stores, Sony reserves the right to replace it with similar value product. This warranty will be void if the unit is defect caused by (1) a state of force / force majeure, accident, misuse, or for commercial purposes which the product has been modified, (2) use of an inappropriate maintenance of the product, as well as negligent maintenance of the product (with liquids chemical/water which causes corrosion), (3) connectivity electrical currents that not appropriate or (4) repair is not performed by the Sony Authorized Service Center. At the point of purchase, please make sure the Warranty Card of your Sony product is stamped by the Dealer. Fill up the Warranty Card and make sure you mail it within 7 days. For the Serial No. field, use the Bar Code found on the sticker. If you already have a Customer Identity Number (My Sony No. ), please fill it in. If you do not have a Customer Identity Number (My Sony No. ), you will receive one soon after registration. If you do not receive one, please call Sony Customer Information Center for it. Cut or tear the Warranty Card along the perforated line. Keep the top portion. Place the bottom portion in a stamped envelope or (PT. 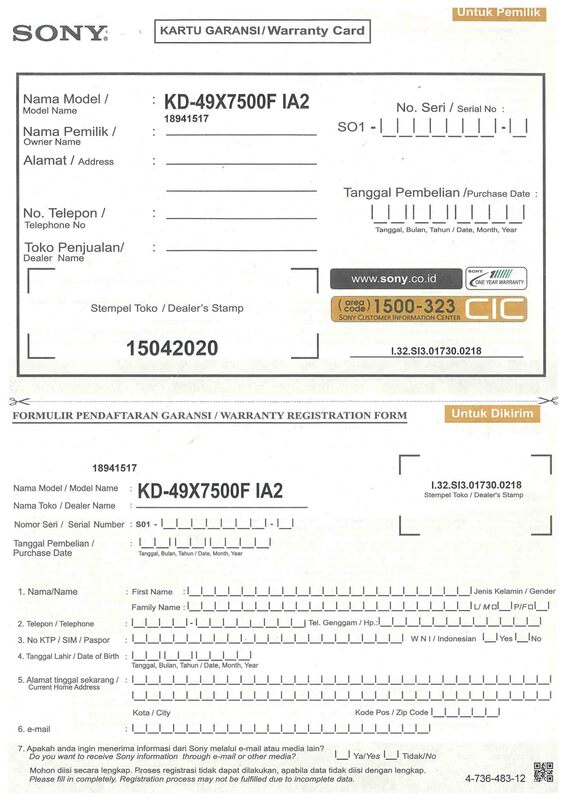 Sony Indonesia postage-paid envelope) and mail it to PT. Sony Indonesia. When your membership for My Sony has been processed, you will receive notification by mail regarding your ID number information to your address.